Readers can find the items found or used in Pathfinder Adventure Path #85: Fires of Creation (Iron Gods 1 of 6), here, along with full rules for using High Technology items in the 5th Edition Dungeons & Dragons game. This entry contains all the items found in Pathfinder Adventure Path #86: Lords of Rust (Iron Gods 2 of 6). With that in mind, I give warning that THE FOLLOWING CONTAINS MINOR SPOILERS FOR LORDS OF RUST and, therefore, should not be read by players who will be playing through that adventure. With that warning out of the way, let’s get to the loot from Lords of Rust! Originally developed for use as tools, chainsaws work remarkably well as weapons and are often used by lunatics or those who want to intimidate their enemies. 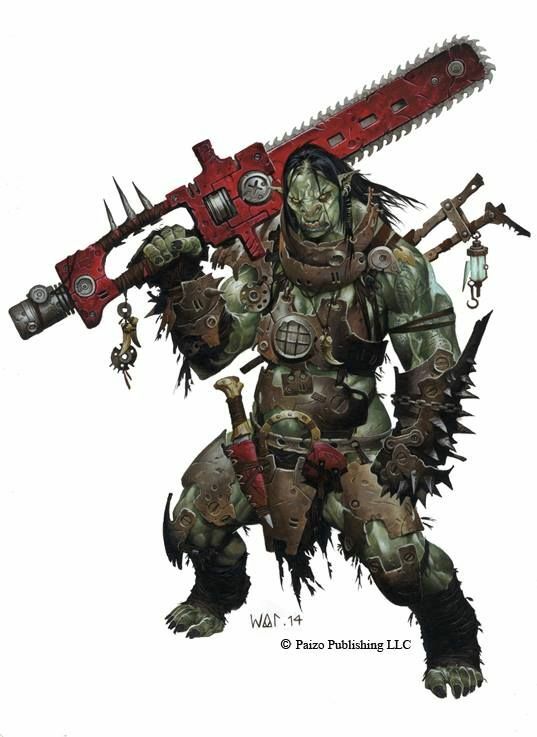 A chainsaw consists of a weighty housing for the engine and power source that is fitted with two handles, and a 2- to 3-foot-long blade extending from the front, around which a whirling, buzzing chain of razor-sharp cutting links spins at blinding speed when the weapon is activated. You spend your Action to activate a chainsaw, and doing so consumes a charge of power. The chainsaw continues to run constantly after activation, draining an additional charge each hour. A dropped chainsaw automatically turns off unless it is set down carefully as a Use Object Action. The buzzing of a chainsaw’s blade is loud and distracting (but not deafening), causing anyone carrying an activated chainsaw to take a -10 penalty on Dexterity (Stealth) checks. An activated chainsaw also grants the wielder Advantage on all Charisma (Intimidation) checks. The Dart Gun makes use of nanotechnology to craft a small pointed projectile that does minimal damage on its own. Unlike other nanotech weapons, the nanites that make up a dart do not have any additional effect on the target. Instead, the Dart Gun contains a small reservoir above its handle into which a single dose of a pharmaceutical, drug, poison, or even potion can be poured as an Action. The next dart fired from the Dart Gun delivers that liquid into the target immediately upon a hit. The EMP Pistol emits a beam of electromagnetic energy that cannot harm living creatures, but deals terrible damage to robots. The EMP Pistol can harm androids and creatures with cybernetic implants, but they take half damage from a hit. A creature that is critically hit by the EMP Pistol and takes damage from that hit must succeed on a DC 13 Constitution saving throw or suffer disadvantage on all ability checks and attack rolls until the start of the attackers next turn. The Grenade Launcher is a bulky weapon that can fire any grenade a great distance. Grenades propelled by a launcher can be set to detonate on impact or at the start of the wielder’s next turn. The Grenade Launcher requires charges to fire, but unless the weapon is also loaded with a grenade, any charges that are consumed are wasted. The Laser Torch is a handheld tool intended to cut through objects with great speed. When activated, a laser torch emits a beam of highly focused light, cutting and burning through surfaces up to 6 inches away. Attackers wielding the Laser Torch do not add their Strength modifier to damage. The beam of a Laser Torch ignores force fields and force effects without damaging the field. Invisible objects and creatures can’t be harmed by a Laser Torch. A description of the Mind Burner can be found on page 63 of Pathfinder Adventure Path #86: Lords of Rust (Iron Gods 2 of 6). When a target is reduced to 0 hit points by a Mind Burner attack, it automatically stabilizes and does not have to make death saving throws. Further, the target suffers disadvantage on Wisdom (Perception) checks and saving throws against spells and abilities that would charm the target. This effect lasts for 1 minute, but at the end of each of its turns, the target can make a Wisdom saving throw against DC 10 to end this effect. This bulky bracelet is covered in blinking blue lights and pulsing holographic emitters. The Hard Light Shield produces a translucent but substantial holographic barrier when activated, which acts as a shield, providing a +2 AC bonus. As a transparent force effect, the Hard Light Shield provides no bonus against lasers. Activating or deactivating the Hard Light Shield takes an action or bonus action. When turned off, a hard light shield provides no AC bonus and does not interfere with spellcasting. The Scatterlight Suit is a tight, form-fitting suit of highly reflective polymers and synthetic metal fibers. It’s designed to reflect beam weapon attacks, such as lasers and EMP beams, and provides only minimal protection against physical damage. Activating the Scatterlight Suit takes an Action; once activated, the suit diffuses and blurs light reflected on its surface, making the wearer appear hazy and indistinct. While active, attacks made with beam weapon attacks and ray magical attacks suffer Disadvantage on attack rolls. This airtight suit of synthetic polymers includes a transparent, dome-like helmet that completely covers the wearer’s head. While powered, the suit provides immunity to inhaled poisons and diseases, and provides resistance against all forms of energy except for thunder damage, as well as complete protection from all radiation and exposure to vacuum. The Spacesuit repairs damage to itself at the rate of 4d6 points of damage per charge consumed. It has AC 10 and 60 hit points. A Spacesuit is fitted with numerous small booster jets that grant the wearer a fly speed of 20 feet in areas of zero gravity while the Spacesuit is charged. The boosters impart no benefit in areas of high, low, or normal gravity. 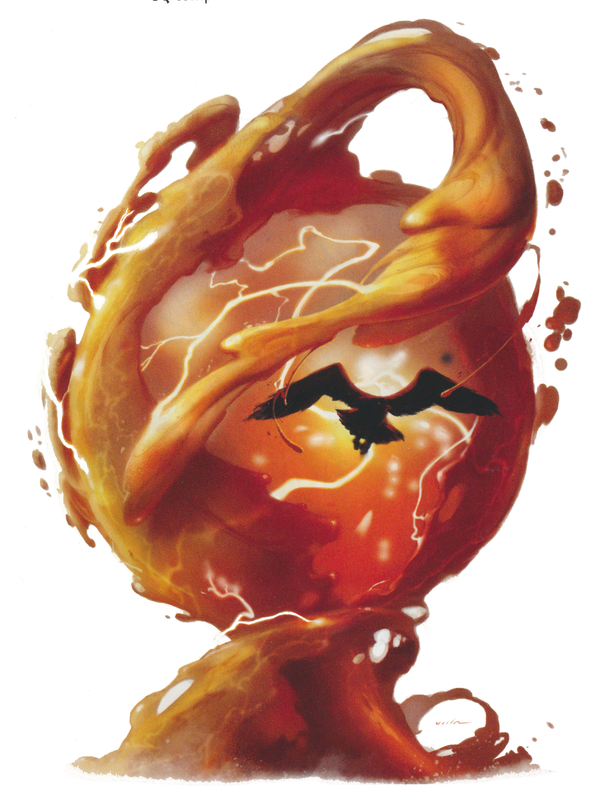 A description of Soothe can be found on page 63 of Pathfinder Adventure Path #86: Lords of Rust (Iron Gods 2 of 6). Rubbing Soothe on a wound or consuming it within 1 minute of receiving the wound heals 2d4 + 2 hit points and grants the target Advantage on all saving throws against fear for the next minute. Using Soothe after 1 minute of receiving a wound only heals 1 hit point of damage. Cylex is an exceptionally stable form of explosive that can be shaped at room temperature, like soft clay. Neon green in color, a single charge of cylex can be triggered to explode by using a detonator (see below) or applying 10 or more points of lightning damage to it in a single attack. When detonated, a single use of cylex explodes in a 40-foot-radius spread and deals 6d6 points of bludgeoning damage and 6d6 points of fire damage to all creatures and objects in the area of effect. A successful DC 15 Dexterity saving throw halves the damage. A detonator is a small device that can be used to trigger cranial bombs, cylex, and other explosives remotely. While an explosive is being set, the user can key the explosive to a detonator with an Action that costs the detonator one charge. Once the explosive is keyed, as an Action the user can push a button to trigger the explosive. A typical detonator has a range of 1,000 feet—though some may have a reduced range (intentionally or otherwise) and others might be enhanced by a signal booster. An emergency raft initially looks like a bright red plastic cylinder, 6 inches wide and 2 feet long. When activated, it rapidly inflates into a tough little boat that measures 10 feet long, 4 feet wide, and 2 feet deep. It can hold four Medium creatures. The raft comes with two pairs of collapsible, dense plastic oars to row with. The raft can be commanded to compact back into its portable shape at a touch of a button, as long as no foreign objects or creatures remain inside. An emergency raft only consumes charges when commanded to unfold or compact. An emergency shelter is a small, 2-foot-long egg-shaped device that can be activated with the touch of a button (a Use Object action). Once activated, the shelter rapidly unfolds and inflates into a 10-foot-radius hut capable of providing shelter for up to six Medium creatures. This process takes 1 minute to complete. The shelter includes pneumatic spike anchors that can attach it to any ground cover softer than metal. Several windows allow those inside to see outside. The interior contains several fluorescent lights. The shelter can withstand winds of up to 120 mph, and provides excellent insulation for those inside, maintaining a temperature between 50 and 80 degrees Fahrenheit. A small combination heater/air scrubber set on the floor near the entrance to the shelter controls the temperature and purifies any noxious external air into breathable air. The hut has immunity to fire and cold and resistance to acid. The dense plastic walls have AC 15 and 10 hit points. The hut cannot float on water. The door is self-sealing, allowing anyone inside an emergency shelter to live in inhospitable conditions with ease for as long as the power holds out. As long as no foreign objects or creatures remain inside an emergency shelter, it can be commanded at the touch of a button to compact back down into its portable shape over the course of 1 minute. After this point, the device consumes 1 charge over the course of 8 hours resetting its internal structure, limiting its deployment to 3 times a day at most. 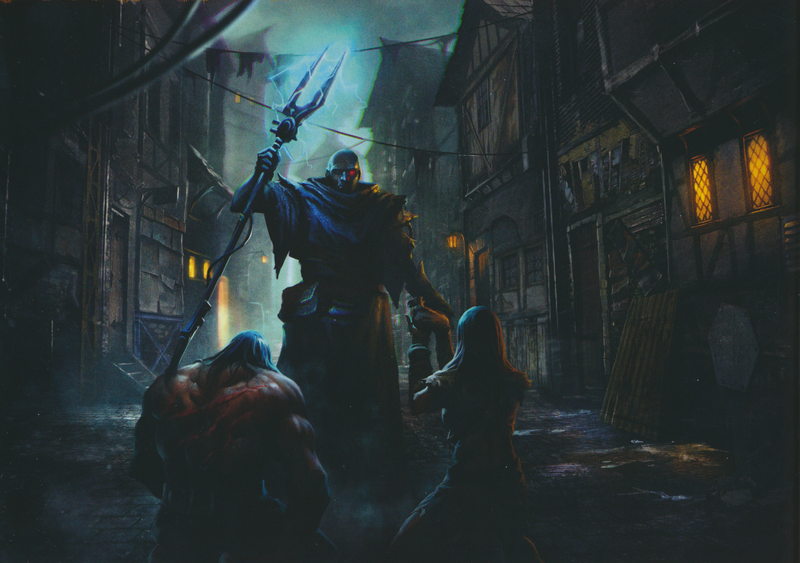 A description of the Envoy’s Mouthpiece can be found on page 62 of Pathfinder Adventure Path #86: Lords of Rust (Iron Gods 2 of 6). The Envoy’s Mouthpiece translates one specific language spoken within 30 feet of the wearer into Androffan. Further, any words spoken by the wearer in Androffan are translated into the same language. This cylindrical device has a nozzle at one end and a handle on one side. When activated as an Action, a fire extinguisher creates a 15-foot cone of misty vapor that swiftly extinguishes fires within its area of effect. Against magical fire effects, such as those created by a wall of fire or similar spell, the fire extinguisher only extinguishes the part of the larger effect its vapors directly contact. Continual magic flames, such as those of a flaming weapon or fire creature, are suppressed for 6 rounds before they automatically reignite. To extinguish an instantaneous fire effect or spell, the wielder must use a Reaction with the fire extinguisher to counter the effect; this can cancel the entire effect, provided the source of the effect is in the extinguisher’s area of effect. At the DM’s discretion, the Fire Extinguisher can be used against a creature immune to fire 4d6 cold damage, or half on a successful Dexterity saving throw against DC 13. The Gravity Clip is a small, disc-shaped device that can be attached to any melee weapon. Once mounted, the clip modulates the weapon’s mass on the moment of impact, via the manipulation of the gravity fields around the weapon. Each successful hit against a target consumes a charge from a gravity clip and causes 2d8 extra bludgeoning damage. A description of the Gas Grenade can be found on page 62 of Pathfinder Adventure Path #86: Lords of Rust (Iron Gods 2 of 6). One round after the Gas Grenade lands, it emits a cloud of smoke that creatures a heavily obscured area in a 20-foot radius. A moderate wind (at least 10 miles per hour) disperses the smoke in 4 rounds; a strong wind (20 or more miles per hour) disperses it in 1 round. Any creatures who enter or begin their turn in the cloud must succeed in a DC 13 Constitution saving throw or suffer the effect of a stinking cloud spell. Deals 4d6 fire damage and 4d6 lightning damage. A hologram generator is a handheld device with a long, thin barrel. It manipulates photons and sound waves to produce highly realistic images and sounds, similar in nature to those generated by figment illusions. Before a hologram generator can generate an image, though, it must store the image in its memory. The maximum size and maximum number of images a generator can store vary according to its color, but storing an image is a Use Object action regardless of the strength of the generator. More powerful generators can store moving images and sounds, or even generate illusions that interact with their environments. Once a hologram generator’s memory is full, additional images overwrite existing images as chosen by the user at the time of their recording. Generating a hologram is a Use Object action. If the hologram generator is then left alone, it continues to project the image until it depletes its charges. Alternatively, the user can aim the hologram at a different location as a move action. A hologram generator is a color-coded item, and the particulars of its abilities, including its energy capacity, the range at which it can create its holograms, and the Wisdom saving throw DC to disbelieve the hologram if it is interacted with, vary as detailed below. These clunky-looking boots have powerful electromagnets built into their soles that activate and deactivate automatically as the wearer flexes her foot, allowing her to walk on a metal surface with relative ease in zero gravity. They also grant the wearer a climb rate equal to her normal speed, while scaling metal surfaces. A full trauma pack has enough supplies to be used 5 times before it is depleted. When using a trauma pack to provide healing, attempt a DC 11 Wisdom (Medicine) check as an Action. If you succeed, the pack provides 4d4 + 4 points of healing. A full trauma pack plus has enough supplies to be used 5 times before it is depleted. When using a Trauma Pack Plus to provide healing, attempt a DC 11 Wisdom (Medicine) check as an Action. If you succeed, the pack provides 8d4 + 8 points of healing. The Trauma Pack Plus can also be used to restore a creature that has died in the last round to life, as if subject to the raise dead spell. To convert the high technology items from Pathfinder to 5E, I decided to write them up in the format 5E uses for magic items (including assigning a “rarity” rating, rather than a gp cost), since that seems to be how they’re presented in the Technology Guide. You may notice that the high technology weapons have pretty long ranges, compared to the ranged weapons in the Player’s Handbook. This was a conscious design decision made to reflect the significant technological advantage these weapons have over their comparatively primitive counterparts. As noted in the Technology Guide, you could easily reskin most of this equipment as fantasy-themed gear and still get use out of these stats. In particular, they would work really well in a steampunk-style game (like, maybe a campaign based on the awesome Battle Chasers comic from the 90s). With the loot from Lords of Rust ready for use in 5th Edition Dungeons & Dragons, the next step in my Iron Gods conversion will be to begin converting the various adversaries found in and around Scrapwall, which I will be starting next week. Last week I introduced the option of summoning robots with your conjure spells, thanks to the Technomancer feat. However, after a quick review of the robots I have converted to date, it seemed that the options were pretty limited for those wishing to unleash hordes of robotic minions on their enemies. 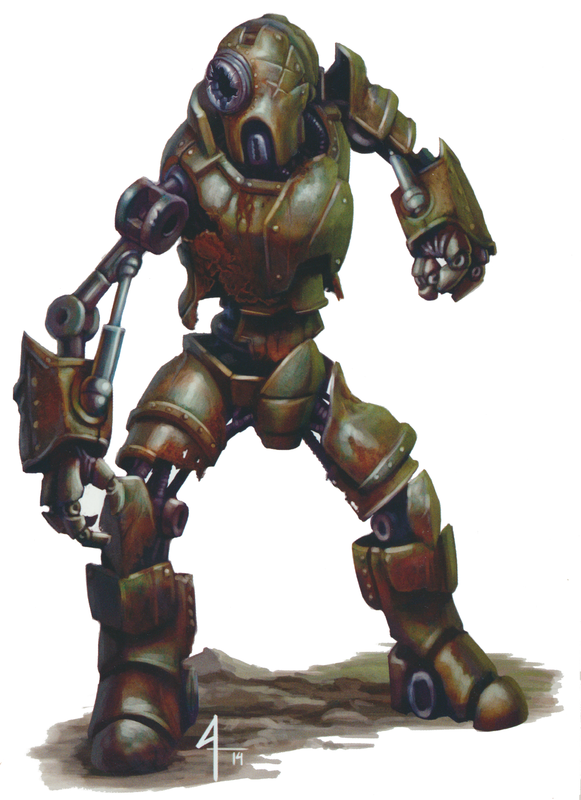 In the interest of addressing that particular problem, I decided to convert over a few of the robots included in Paizo’s Numeria, Land of the Fallen Stars sourcebook, as well as a bunch of other neat monsters from that sourcebook because, well, they’re pretty cool. Barbs. A creature that touches the bloodbrush or hits it with a melee attack while within 5 feet of it takes 3 (1d6) piercing damage and the target must succeed on a DC 12 Constitution saving throw or be poisoned for 1 minute. The poisoned target is poisoned, and it can repeat the saving throw at the end of each of its turns, ending the effect on a success. Overrun. 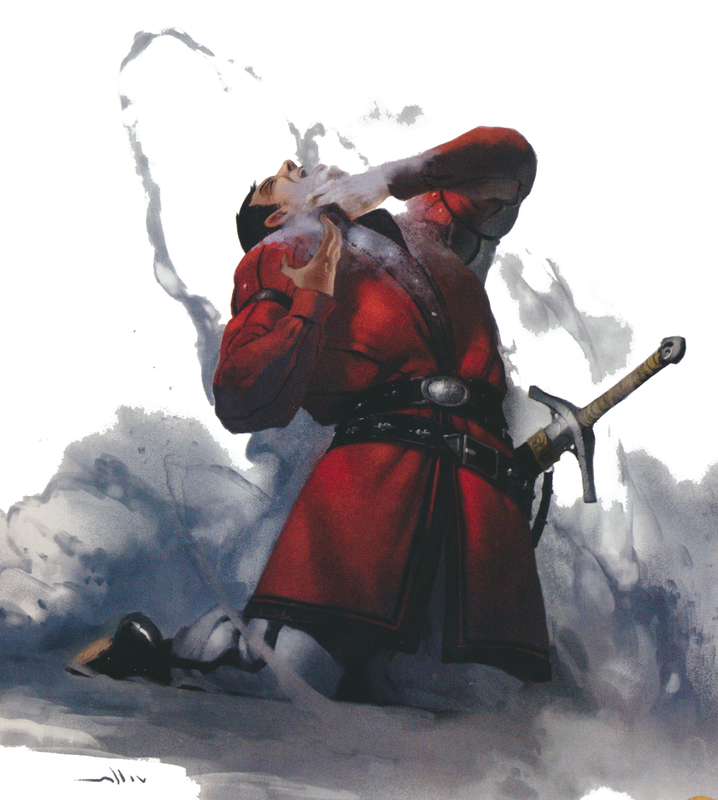 If the bloodbrush moves at least 20 feet straight towards a creature and then hits it with a slam attack on the same turn, that target must succeed on a DC 12 Strength saving throw or be knocked prone. If the target is prone, the bloodbrush can make one slam attack as a bonus action. Slam. Melee Weapon Attack: +4 to hit, reach 5 ft., one target. Hit: 9 (2d6 + 2) bludgeoning damage and the target is grappled (escape DC 12). Until the grapple ends, the target is restrained and has disadvantage on Strength checks and Strength saving throws. The target must also succeed on a DC 12 Constitution saving throw or be poisoned for 1 minute. The poisoned target is poisoned, and it can repeat the saving throw at the end of each of its turns, ending the effect on a success. Amorphous. The capacitor ooze can move through a space as narrow as 1 inch wide without squeezing. Electrified. A creature that touches the capacitor ooze or hits it with a melee attack while within 5 feet of it takes 10 (3d6) lightning damage. Neurophagic Jolt. If a target stunned by the capacitor ooze’s neurophagic pseudopod is hit by a capacitor ooze’s neurophagic pseudopod while still stunned, the creature must make a DC 17 Wisdom saving throw or suffer disadvantage on all Dexterity and Intelligence saving throws for 1 minute. The target can repeat the saving throw at the end of each of its turns, ending the effect on a success. Osmotic Drain. At the start of the capacitor ooze’s turn, each creature within 10 feet of the capacitor ooze carrying at least one device that is powered by or generates electricity must succeed on a DC 17 Constitution saving throw or lose 1 charge from a random powered device. Neurophagic Pseudopod. Melee Weapon Attack: +11 to hit, reach 5 ft., one target. Hit: 29 (4d10 + 7) bludgeoning damage plus 10 (3d6) lightning damage and the target must succeed on a DC 17 Constitution saving throw or be stunned until the end of the capacitor ooze’s next turn. Damage Immunities: poison, psychic; bludgeoning, piercing, and slashing from weapons. Amorphous. The gray goo can move through a space as narrow as 1 inch wide without squeezing. Dismantle. Any objects, including melee weapons, that come into contact with the gray goo begin to be disassembled. Each round the object is in contact with the gray goo, it takes a permanent and cumulative -1 penalty to the AC it offers or -1 penalty to damage rolls. If the armor AC reaches 10, if a shield’s bonus drops to +0, or if the penalty to damage rolls reaches -5, the object is destroyed. Dispersion. As a reaction, the gray goo can disperse, spreading itself across an area of up to 30 feet. While dispersed, the gray goo cannot attack or take hostile actions, though it can make a Dexterity (Stealth) ability checks to hide. The gray goo cannot reform for 1d4 rounds. Immutable Form. The gray goo is immune to any spell or effect that would alter its form. Swarm. The swarm can occupy another creature’s space and vice versa, and the swarm can move through any opening 1 inch or larger. The swarm can’t regain hit points or gain temporary hit points. Multiattack. The gray goo makes three disassemble attacks. Disassemble. Melee Weapon Attack: +10 to hit, reach 5 ft., one target. Hit: 22 (5d6 + 5) slashing damage and the target must make a DC 17 Dexterity saving throw. On a failed save, one of the target’s weapons or armor, determined at random, takes a permanent and cumulative -1 penalty to the AC it offers or -1 penalty to damage rolls. If the armor AC reaches 10, if a shield’s bonus drops to +0, or if the penalty to damage rolls reaches -5, the object is destroyed. Infest. The gray goo attempts to infest one target’s body. The target must succeed on a DC 17 Constitution saving throw, or it takes 45 (10d6 + 10) slashing damage as the gray goo disappears inside its body. While it is infesting a target, the gray goo cannot take any actions other than to leave the target’s body, but the target takes 45 (10d6 + 10) slashing damage at the start of each of its turns. The target can repeat the saving throw at the end of each of its turns, and the gray goo is expelled from the target’s body on a success. 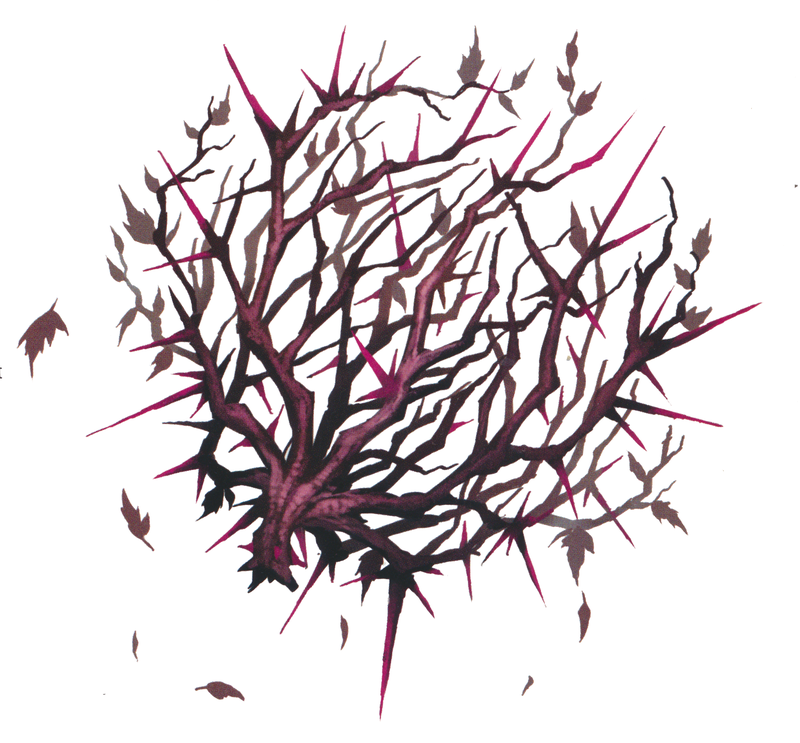 The gray goo cannot be targeted by attacks or spells while it infests the target’s body, but if the infested target is subject to an effect that cures a disease, the gray goo is expelled. False Flesh. The synthetic flesh and hair on the mannequin robot grant it advantage on Deception checks to appear human, unless the target it is deceiving touches the mannequin robot’s cold, synthetic skin. Vulnerable to Critical Hits. When the mannequin robot is hit with a critical hit, it must make a DC 15 Constitution saving throw or be stunned for 1 round. Multiattack. The mannequin robot makes two slam attacks. Slam. Melee Weapon Attack: +3 to hit, reach 5 ft., one target. Hit: 5 (1d6 + 2) bludgeoning damage. Alert Sentry. The mannequin robot’s advance sensors grant it advantage on all Wisdom (Perception) checks. Durable Frame. The mannequin robot’s advanced robotic frame provides a measure of protection against attacks. When an attacker hits the mannequin robot, it must roll damage dice twice and take the lower of the two results. Multiattack. The mannequin robot makes two melee attacks or two ranged attacks. Slam. Melee Weapon Attack: +5 to hit, reach 5 ft., one target. Hit: 5 (1d6 + 2) bludgeoning damage. Laser Rifle. Ranged Weapon Attack: +6 to hit, range 150/600, one target. Hit: 12 (2d8 + 3) radiant damage. 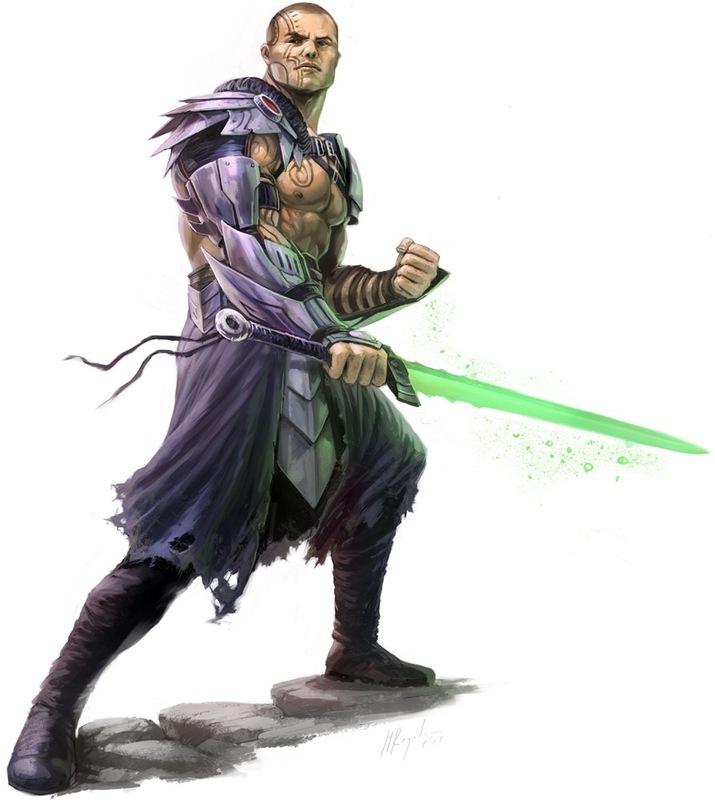 Speed 10ft., fly 60 ft.
Damage Immunities: poison, psychic; bludgeoning, piercing, and slashing from nonmagical weapons that aren’t adamantine. Berserk. Whenever the golem takes lightning damage, the golem goes berserk for 1d4 rounds. On each of its turns while berserk, the golem attacks the nearest creature it can see. If no creature is near enough to move to and attack, the golem attacks an object, with a preference for an object smaller than itself. Lightning Resistance. Whenever the golem is subject to lightning damage, it takes no damage and instead regains a number of hit points equal to the lightning damage and goes berserk. Multiattack. The robot golem makes two slam attacks. Slam. Melee Weapon Attack: +5 to hit, reach 10 ft., one target. Hit: 15 (2d8 + 6) bludgeoning damage. Shockwave (Recharge 5-6). The robot golem releases a pulse of lightning and all creatures within 30 feet of the robot golem must succeed on a DC 17 Dexterity saving throw, taking 45 (10d8) lightning damage on a failed save, or half as much damage on a successful one. Durable Frame. The scrapyard robot’s advanced robotic frame provides a measure of protection against attacks. When an attacker hits the scrapyard robot, it must roll damage dice twice and take the lower of the two results. Fall to Pieces. Attacks and effects that deal more than 12 points of damage in a single hit impair one of the robot’s components. Determine which subsystem by rolling 1d6 and consulting the table below. 1 CPU: The robot behaves as if subject to a confusion spell. 2 Fractured Plating. The robot’s AC is reduced by 3. 3 Power Core. 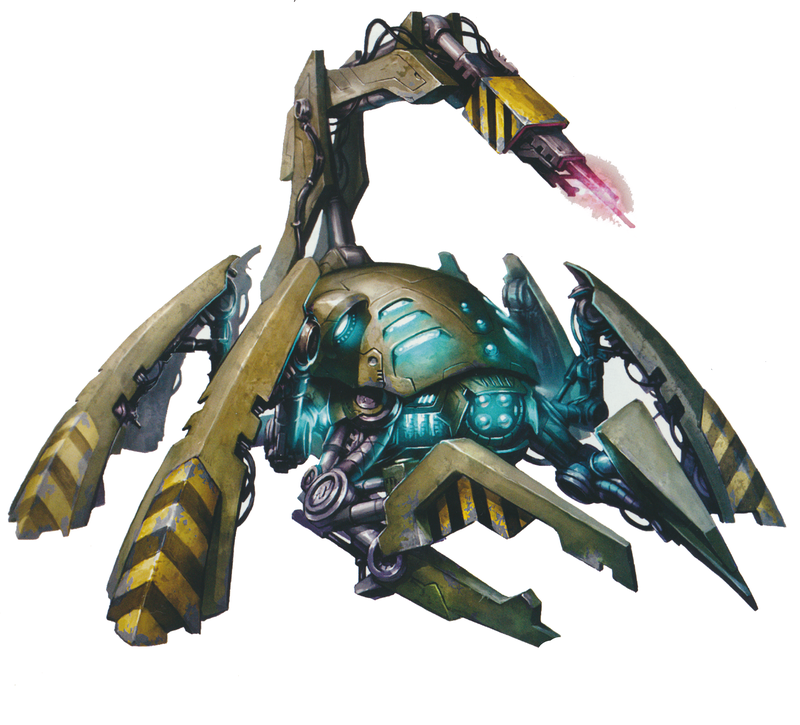 A creature that touches the robot or hits it with a melee attack while within 5 feet of it takes 4 (1d6) lightning damage. 1d4 + 1 rounds after this subsystem is damaged the robot shuts down. 4 Rotary Saw. The robot loses its saw attack. 5 Servos. The robot’s speed is reduced to 15 feet. 6 Sensors. The robot is blinded. Vulnerable to Critical Hits. When the scrapyard robot is hit with a critical hit, it must make a DC 15 Constitution saving throw or be stunned for 1 round. Multiattack. The scrapyard robot makes one claw attack and one saw attack. Claw. Melee Weapon Attack: +5 to hit, reach 5ft., one target. Hit: 6 (1d6 + 3) piercing damage. Saw. Melee Weapon Attack: +5 to hit, reach 5ft., one target. Hit: 12 (2d8 + 3) slashing damage. Repair. The scrapyard robot that is adjacent to the inactive body of another robot can regain 2d8 hit points. Amphibious. The targotha can breathe air and water. Legendary Resistance (3/Day). If the targotha fails a saving throw, it can choose to succeed instead. Multiattack. The targotha can make three attacks: one with its bite and two with its razor fins. Bite. Melee Weapon Attack: +11 to hit, reach 15 ft., one target. Hit: 17 (2d10 + 6) piercing damage plus 7 (2d6) poison damage. Razor Fins. Melee Weapon Attack: +11 to hit, reach 5 ft., one target. Hit: 13 (2d6 + 6) slashing damage. Jolt. Ranged Spell Attack: +6 to hit, range 150 ft., one target. Hit: 10 (2d8 + 1) lightning damage and the target must succeed on a DC 18 Constitution saving throw or it is stunned until the start of the targotha’s next turn. This attack does not suffer disadvantage when the targotha is engaged in melee. Volatile Breath (Recharge 6). The targotha exhales poisonous gas in a 60-foot cone. Each creature in that area must make a DC 18 Constitution saving throw, or it suffers the effects of the confusion spell for 1 minute. The target can repeat the saving throw at the end of each of its turns, ending the effect on a success. As a bonus action, the targotha can ignite the gas, forcing each creature in the area to make a DC 18 Dexterity saving throw, or it suffers 56 (16d6) fire damage on a failed saving throw, or half as much on a successful one. LEGENDARY ACTIONS The targotha can take 3 legendary actions, choosing from the options below. Only one legendary option can be used at a time and only at the end of another creature’s turn. The targotha regains spent legendary actions at the start of its turn. Detect. The targotha makes a Wisdom (Perception) check. Tail Attack. The targotha makes a tail attack. Jolt. The targotha makes a jolt attack. Durable Frame. The torturer robot’s advanced robotic frame provides a measure of protection against attacks. When an attacker hits the mannequin robot, it must roll damage dice twice and take the lower of the two results. Force Field. The torturer robot is surrounded by a shimmering field of energy that makes it immune to critical hits, while the field is active. The force field has a buffer of 40 hit points which the torturer robot loses before it loses its own hit points. The force field regenerates 4 hit points at the start of each of the torturer robot’s turns. Nanosurgeon (Recharge 5-6). 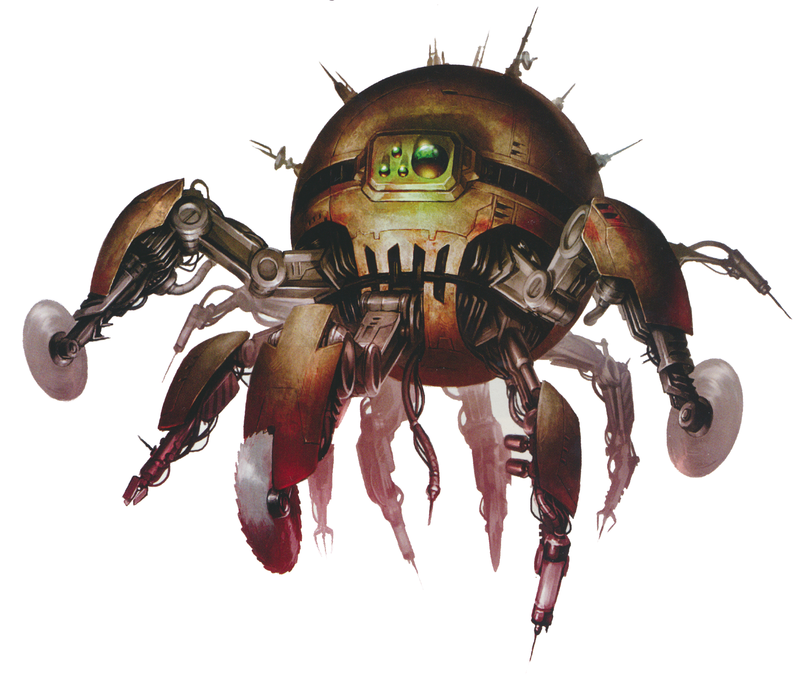 The torturer robot can inject purpose-programmed nanites that duplicate the cure wounds, lesser restoration and protection from poison spells as if cast using a 5th level spell slot. The torturer robot’s spellcasting ability bonus is considered to be zero for the purpose of these effects. Reactive Gyros. The antigrav generators that grant a torturer robot flight also grant it advantage on all Dexterity saving throws. Vulnerable to Critical Hits. When the torturer robot is hit with a critical hit, it must make a DC 15 Constitution saving throw or be stunned for 1 round. Multiattack. 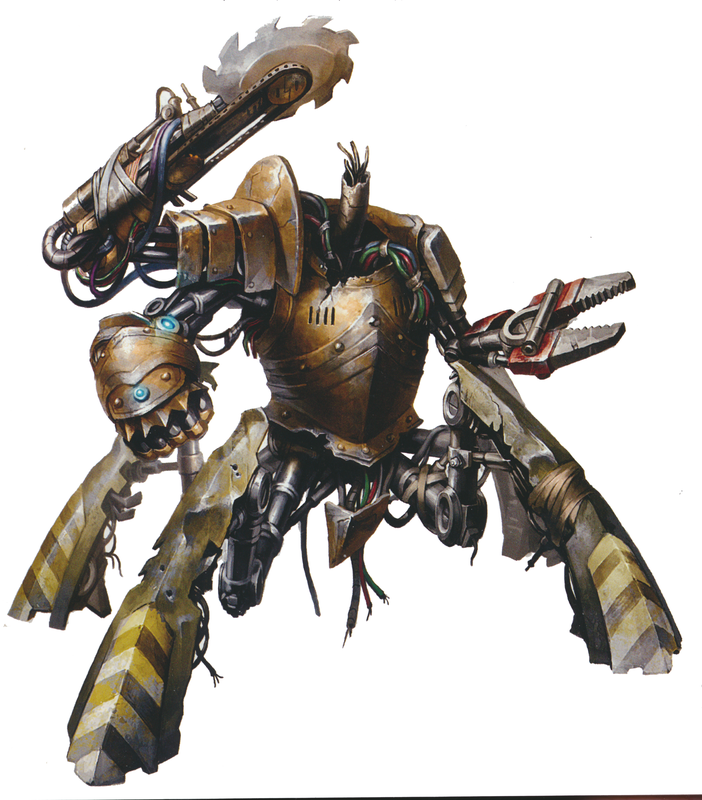 The torturer robot makes four melee attacks or four ranged attacks. Rotating Blade. Melee Weapon Attack: +8 to hit, reach 5 ft., one target. Hit: 7 (1d4 + 5) slashing damage. Surgical Laser. Ranged Weapon Attack: +8 to hit, range 50, one target. Hit: 8 (1d6 + 5) radiant damage. Speed 20ft., burrow 10 ft., swim 20 ft.
Slam. Melee Weapon Attack: +4 to hit, reach 5 ft., one target. Hit: 3 (1d4 + 1) bludgeoning damage. Constrict. Melee Weapon Attack: +4 to hit, reach 5 ft., one target. Hit: 5 (1d8 + 1) bludgeoning damage and the target is grappled (escape DC 14). Until the grapple ends, the creature is restrained, and the snake can’t constrict another target. As with my other conversions, I based these on existing 5E monsters, but tried to keep many of the cool, unique abilities from the original Pathfinder write-ups (like the abilities of the gray goo, the scrapyard robot, and the capacitor ooze). Of all of these monsters, the most lethal is likely the gray goo and I look forward to unleashing it on my PCs. Each of the robots above could easily be reskinned as a golem of some sort, for use in campaigns that don’t feature a high technology component. 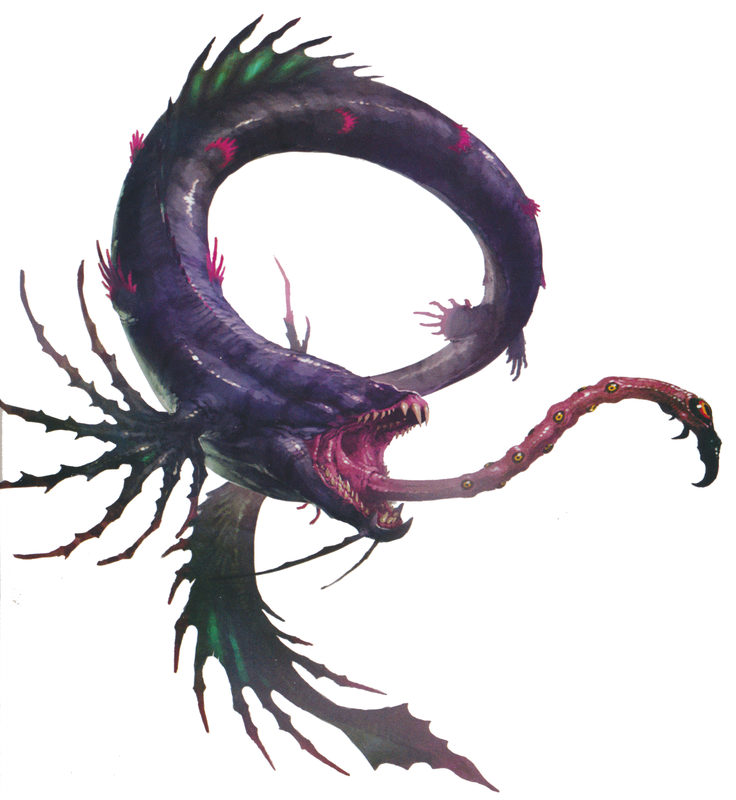 The targotha could pass for a variant aboleth or dragon turtle (a dragon eel?). These monsters should give both players and DMs a variety of new high tech threats to add their Iron Gods campaigns. Next week I hope to have a 5E version of the Pathfinder RPG Oracle class and then I will be moving on to the second adventure in the Iron Gods adventure path, Lords of Rust. In the course of preparing to run my own version of the Iron Gods adventure path, I came across the terrifying variety of high technology diseases and poisons in Paizo’s incredible Numeria, Land of Fallen Stars sourcebook. I really love the idea of player characters being exposed to exotic illnesses as they plumb the depths of millennia old starship ruins, particularly if those illnesses manifest as creepy symptoms (like circuitry-like traces spreading across a character’s scalp), and those diseases and poisons, once converted to 5E rules, will give me plenty of uniquely nasty hazards to throw at my players. Since I will be using these hazards in my own campaign, I figured I would reproduce those rules here. However, I won’t be reproducing any of the descriptive information found in the Numeria sourcebook relating to these diseases and hazards. When a creature comes into contact with an area or creature infected by bluespit, the creature must succeed on a DC 12 Constitution saving throw or become infected. It takes 1d4 hours for bluespit’s symptoms to manifest in an infected creature. Symptoms include coughing up blue-tinged sputum. The infected creature suffers one level of exhaustion, and it regains only half the number of hit points from spending Hit Dice and no hit points from finishing a long rest. At the end of each long rest, an infected creature must make a DC 12 Constitution saving throw. On a failed save, the character gains one level of exhaustion. On a successful save, the character’s exhaustion level decreases by one level. If a successful saving throw reduces the infected creature’s level of exhaustion below 1, the creature recovers from the disease. A creature that is exposed to airborne spores or corpses of those killed by coward’s mark must succeed on a DC 12 Constitution saving throw or become infected. One week after becoming infected, round marks on the skin appear, and the character must make a DC 12 Wisdom saving throw every time any other creature comes within 30 feet of the infected creature. If the infected creature fails this saving throw, it becomes frightened. It may repeat its saving throw at the end of each of its turns. Once it makes a successful saving throw against a specific approaching creature, it does not need to make another saving throw until it completes a long rest. At the end of each long rest, the infected creature can make a DC 12 Constitution saving throw. On a successful save, the DC for this save and the Wisdom saving throw drops by 1d6. When the saving throw DC reaches 0, the creature recovers from the disease. On a failure, the Wisdom saving throw DC increases by 1. When it reaches DC 20, the infected creature suffers the effects of long-term madness (found on pages 259-260 of the Dungeon Master’s Guide) and only feels safe in total solitude. When a creature comes into contact with an area or creature infected by final rest, the creature must succeed on a DC 14 Constitution saving throw or become infected. It takes one week for final rest’s symptoms to manifest in an infected creature. Symptoms include lack of motivation and flatness of affect. The infected creature disadvantage on all Charisma ability checks. At the end of each long rest, an infected creature must make a DC 14 Constitution saving throw. On a failed save, the character gains one level of exhaustion. On a successful save, the character’s exhaustion level decreases by one level. If a successful saving throw reduces the infected creature’s level of exhaustion below 1, the creature recovers from the disease. A creature that is exposed to an area or creature infected by fractal etch, or who is injected with fractal etch nanites, must succeed on a DC 15 Constitution saving throw or become infected by this high technology disease. One week after becoming infected, the creature makes a DC 15 Constitution saving throw or it takes 5 (1d10) necrotic damage and its hit point maximum is reduced by an amount equal to the damage taken. This reduction lasts until the target is cured of fractal etch. The infected creature dies if this effect reduces its hit point maximum to 0 and it cannot rise as an undead creature. If, while infected, the creature is exposed to 10 or more points of lightning damage from a single effect, it makes a DC 15 Constitution saving throw. On a success, it is cured of fractal etch, and on a failure it is stunned until the end of its next turn. Spells or other abilities that suppress or affect high technology effect fractal etch. At the end of each long rest, the infected creature can make a DC 15 Constitution saving throw. On a successful save, the DC for this save drops by 1d6. When the saving throw DC reaches 0, the creature recovers from fractal etch. On a failure, the target takes 5 (1d10) necrotic damage and its hit point maximum is reduced by an amount equal to the damage taken. A creature that comes into physical contact with a creature infected by shattermind must succeed on a DC 14 Charisma saving throw or become infected. Starting one day after becoming infected, the creature suffers disadvantage on Wisdom ability checks and saving throws. At the end of each long rest, the infected creature can make a DC 14 Charisma saving throw. On a failure, the creature suffers the effects of long-term madness (found on pages 259-260 of the Dungeon Master’s Guide) until it completes a long rest. Once the infected creature succeeds on three saving throws, it is cured of shattermind. The lesser restoration spell does not cure shattermind, it simply allows the infected creature to make another DC 14 Charisma saving throw, as if it had completed a long rest. A creature that is bitten by a creature infected by soldier’s peace, or who is injected with soldier’s peace nanites, must succeed on a DC 14 Charisma saving throw or become infected by this high technology disease. One day after becoming infected, once per round, the creature must succeed on a DC 14 Charisma saving throw the first time it attempts to attack or otherwise injure another creature. On a failure, the infected creature is incapacitated until the end of its next turn, then poisoned for another 1d4 rounds. On a success, the creature is merely poisoned until the end of its next turn. Spells or other abilities that suppress or affect high technology effect soldier’s peace. Soldier’s peace can only be cured by magical or high technology means. 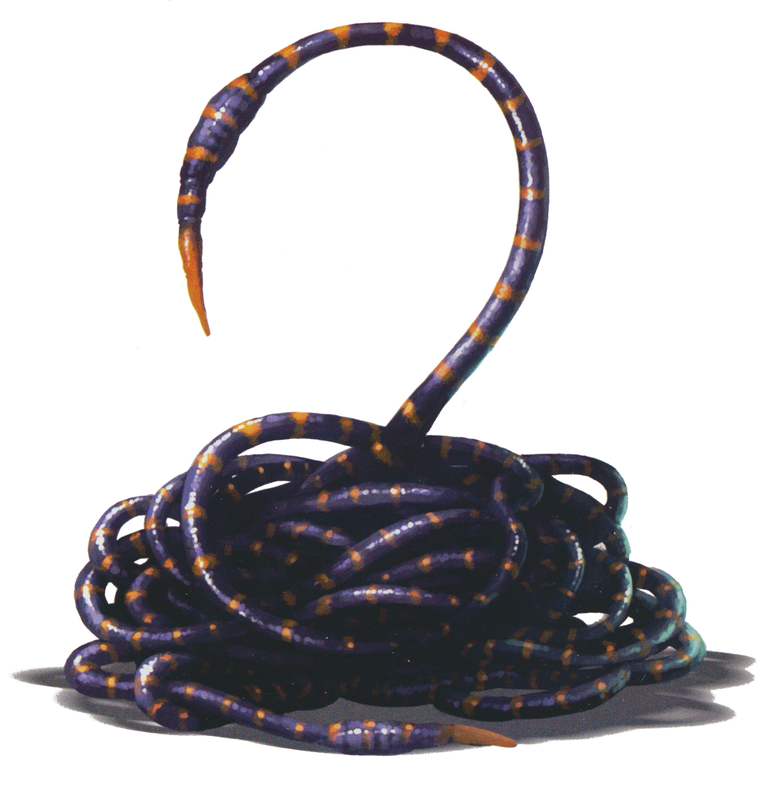 A creature that is bitten by a creature infected by thought crawlers, or who is injected with thought crawlers, must succeed on a DC 14 Constitution saving throw or become infected by this disease. One day after becoming infected, the infected creature become easily influenced and treats any request as though delivered with a suggestion spell. The infected creature can resist this with a successful DC 12 Wisdom saving throw. At the end of each long rest, the infected creature can make a DC 14 Constitution saving throw. On a successful save, the DC for this save drops by 1d6. When the saving throw DC reaches 0, the creature recovers from the disease. On a failure, the Wisdom saving throw DC increases by 1. When the Wisdom save reaches DC 14, the infected creature must succeed on a Wisdom saving throw every time it is provoked or insulted. On a failure, the target must attack the provoking or insulting target for 1 round. If attacked, the target automatically responds, in kind (there is no saving throw to prevent this). When the Wisdom save reaches DC 20, the infected creature must succeed on a DC 14 Constitution saving throw each round it is under stress (such as being in combat) or be poisoned until the end of its next turn. Bloodbrush Extract (Inhaled)(150 gp per dose). A creature subjected to this poison must succeed on a DC 11 Constitution saving throw or suffer disadvantage on all Wisdom (Perception) ability checks for 2 hours. A creature may elect to fail this saving throw. However, for the duration, the poisoned creature also gains advantage on all Intelligence (Arcana) and Intelligence (Religion) checks. Starspore (Ingested or Inhaled) (150 gp per dose). A creature subjected to starspore must succeed on a DC 14 Constitution saving throw or gain Vulnerability to thunder damage and disadvantage on Constitution saving throws for 1 hour. A creature may elect to fail this saving throw. However, for the duration, the poisoned creature gains blindsight with a range of 60 feet. Each of these is based, in part, on one of the diseases or poisons found in the 5th Dungeon Master’s Guide. Overall, I wish there were more diseases in the DMG (wait, did that come out right? ), if only to provide better guidance on how 5E diseases should be designed, but I believe that these new diseases are balanced against those found in the official 5E source. Each of these diseases and poisons, including the high technology diseases, could easily be reskinned to be a non-technological hazard, particularly if you ignore the high technology aspects of Fractal Etch and Soldier’s Peace. These Numerian threats more than double the number of diseases that a 5th Edition D&D DM has to throw at their players and, if nothing else, they should give the life domain clerics in their campaign something useful to do with their lesser restoration spell. Please enjoy them in good health (I made a Wisdom saving throw against making that joke, but failed…). 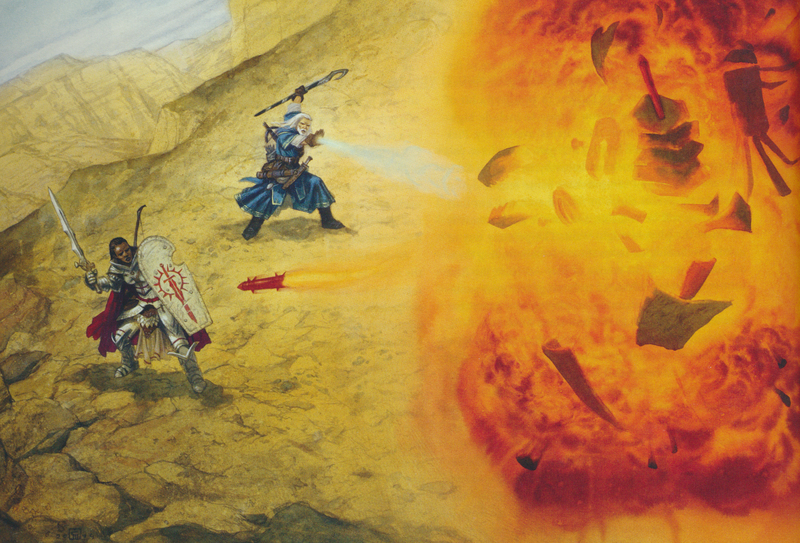 The following spells are drawn from Paizo’s outstanding Technology Guide. I was reluctant to convert these over, since 5th Edition D&D seems to have dealt away with the kind of hyper-specialized spells that have characterized earlier editions of the game. However, in a campaign like Iron Gods, where high technology plays such a prominent role, these spells may see more consistent use, so I decided it would be worth converting these spells over to 5E. 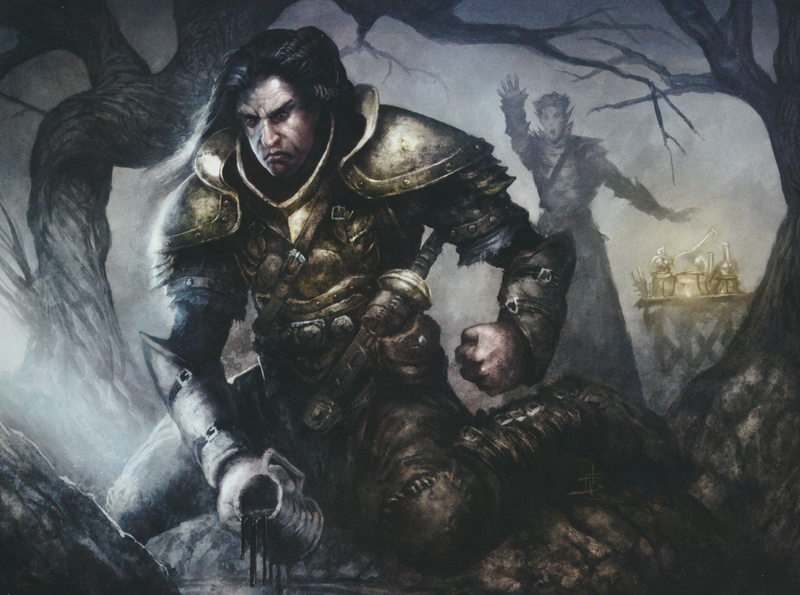 Each of these are assumed to be new additions to the alchemist, cleric, druid, magus, and wizard spell lists but, given that these spells relate to high technology, DMs may wish to restrict them to characters who have the Technomancer feat, the Artificer cleric domain, and/or the Renegade Technic Leaguer or the Kellid Tribesman backgrounds. You bring into being a mobile, hemispherical energy field that prevents high technology items, signals, and creatures from entering. An antitech field suppresses any high technology effect used within, brought into, or deployed into the area, but does not negate it. Time spent within an antitech field counts against the suppressed effect’s duration. Robots and other technological constructs that come in contact with an antitech field must attempt a Constitution saving throw each round they remain in the field or be stunned. Success indicates the creature suffers disadvantage on its ability checks and attack rolls until it leaves the antitech field. An affected robot can make a new Constitution saving throw at the end of each of its turns. On a success, they are no longer stunned, but suffer disadvantage on it ability checks and attack rolls until it leaves the antitech field. Partially technological creatures like androids or cyborgs merely suffer disadvantage on all attack rolls and ability checks if they fail this saving throw. Note that cybernetic equipment does not function in an antitech field, and all benefits granted by such gear are suppressed. Non-technological creatures can enter the area, as can low-tech missiles like sling stones and arrows. High-tech missiles such as bullets and missiles, as well as high-tech rays like lasers and particle beams, immediately halt upon contacting the field, and either drop to the ground harmlessly or detonate. The antitech field does not offer any protection against explosions caused by technological explosives detonating against it—thus, creatures within the field could still take damage from a rocket that explodes against it. If a creature is larger than the area enclosed by the barrier, any part of the creature that lies outside the barrier is unaffected by the field. This spell can be used only defensively, not aggressively. Forcing an abjuration barrier against creatures that the spell keeps at bay collapses the barrier. You create a 10-foot-radius, 20-foot-tall cylinder of magical energy centered on a point on the ground that you can see within range. Glowing runes appear wherever the cylinder intersects with the floor or other surface. While active, robots and other high technology creatures can’t willingly enter the cylinder by nonmagical means. If the creature tries to use teleportation or interplanar travel to do so, it must first succeed on a Charisma saving throw. Robots and other high technology creatures suffer disadvantage on attack rolls against targets within the cylinder. Targets within the cylinder can’t be charmed, frightened, or possessed by robots and other high technology creatures. When you cast this spell, you can elect to cause its magic to operate in the reverse direction, preventing a robot or other high technology creature from leaving the cylinder and protecting targets outside it. At Higher Levels. When you cast this spell using a spell slot of 5th level or higher, the duration increases by 1 hour for each slot level above 4th. You shroud the targeted high technology item, or robot or other high technology creature, with disruptive magical energy. The target (or creature carrying the targeted item) must succeed on a Wisdom saving throw when you cast this spell or be stunned for the duration of the spell. At Higher Level. When you cast this spell using a spell slot of higher, it targets one additional target for each slot level above 4th. For the duration, you sense the presence of radiation within 30 feet of you. If you sense radiation in this way, you can use your action to see a faint aura around any visible creature, item, or area that bears radiation which informs you of the level of radioactivity. This spell can penetrate most barriers, but it is blocked by 1 foot of stone, 1 inch of common metal, a thin sheet of lead, or 3 feet of wood or dirt. Discharge dissipates the charges from one high technology item, temporarily depowers one electrically powered high technology item that does not use charges, or severely hinders a robot. If the spell targets an item with charges, the object loses all of its remaining charges. If the object is powered by electrical means other than charges, its functions are suppressed for 1d4 rounds. If the spell targets a non-robot creature, the target must make a Constitution saving throw or one charged or electrically powered item on their person is affected, as described above. If the target is a robot, the robot must succeed on a Constitution saving throw or it suffers disadvantage on ability checks and attack rolls for 1 minute. An affected robot can make a new Constitution saving throw at the end of each of its turns. On a success, the effect of the spell ends. At Higher Levels. When you cast this spell using a spell slot of 5th level or higher, you double the number of high technology items you affect for each spell slot level over 4th level. You flood a 10 foot radius area with Low Level Radiation that lasts until the start of your next turn. At Higher Levels. When you cast this spell using a spell slot of 4th level or higher, you increase the level of Radiation by one for each spell slot level over 3rd level, to a maximum of Severe Radiation Level using a 6th level spell slot. When cast using a higher level spell slot, the radiation spreads, per the standard 5E radiation rules. You restore a broken item, or damaged robot or construct, to a functional state, as if it were new and intact. Any pieces missing from the item or construct remain missing. Significant missing pieces may prevent proper functioning. If the item uses charges, the item becomes fully charged. A timeworn item becomes fully charged, but doesn’t lose the timeworn condition (this spell is one of the few ways a timeworn item can be recharged). For 1 hour after this spell is cast on a timeworn item, that item does not suffer any chance of glitching. Other consumables such as ammunition are not restored. When this spell is cast upon a damaged robot or construct, all hit point damage dealt to that creature is healed. When this spell is cast upon a destroyed robot or construct, it is restored to full functionality and full hit points, provided no significant portion of the destroyed construct (such as an entire limb) is missing. Robots and constructs brought back in this fashion regain their memories up to the moment of their destruction and have no particular inclination to serve the caster. Until the spell ends, one willing creature you touch is protected against robots and other high technology creatures have disadvantage on attack rolls against the target. The target also can’t be charmed, frightened, or possessed by them. If the target is already charmed, frightened, or possessed by such a creature, the target has advantage on any new saving throw against the relevant effect. You restore up to 10 charges to a battery or half that number of charges to a high technology item capable of being charged by a battery. If you recharge a battery, there is a 20% chance that the battery is destroyed by the attempt. If you restore more charges than the item can hold, the creature holding the item must succeed at a Dexterity saving throw or take 1d6 points of lightning damage for each excess charge. This spell provides no knowledge of how many charges an item can safely hold, but you can choose to bestow fewer charges than the maximum allowed to reduce the risk; you must declare how many charges you are restoring before casting this spell. You remove all radiation from a 20 foot radius around the point you touch. However, this spell has no effect on naturally radioactive materials, and as long as such materials remain in an area, the radiation that was removed may return. At Higher Levels. When you cast this spell using a spell slot of 8th level or higher, this spell affects naturally radioactive materials, such as nuclear reactors or atomic warheads, as well. For the duration, you detect the presence of high technology within 30 feet of you. If you sense high technology in this way, you can use your action to see a faint aura around any visible creature or object in the area that is of high technology origin, and you learn its rough function (weapon, pharmaceutical, robot, etc…). Using this spell grants you advantage on your first Intelligence check made to understand how to use a high technology item. This spell can penetrate most barriers, but it is blocked by 1 foot of stone or 3 feet of wood or dirt. While I was initially skeptical of whether it was necessary to convert these spells over from Pathfinder to 5E, now that they are done, I think they will add a lot to an Iron Gods campaign. In particular, assuming that most of these spells were created by the Technic League, I think that these spells can help to explain why the League is so much better at dealing with high technology than any other group. 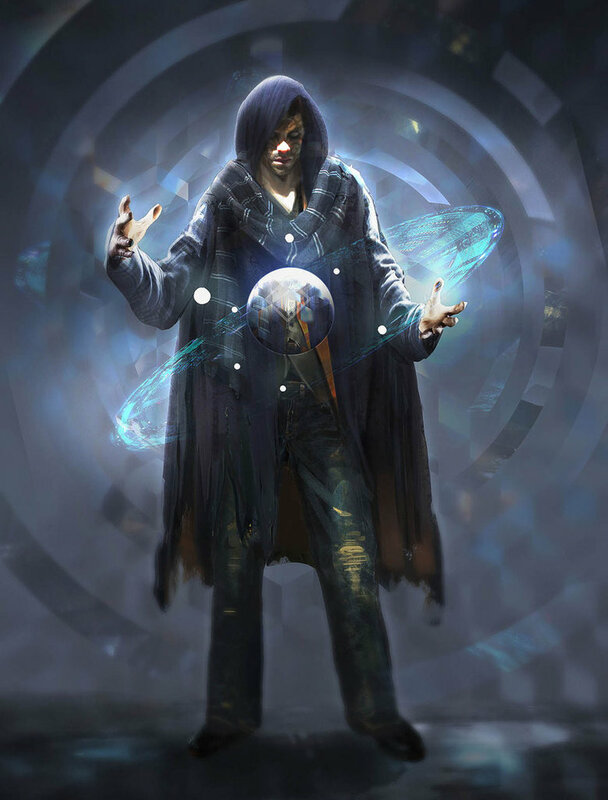 In my own Iron Gods campaign, in the interest of keeping high technology as mysterious as I can, I will likely restrict all of them to player characters who have the Technomancer feat and either the Renegade Technic Leaguer or Kellid Tribesman backgrounds. Incidentally, in my conversion of the memory of function spell, I chose to dump the restriction that the Pathfinder version has relating to time (the PF version can only affect items destroyed up to 10 years per caster level ago). Most of the high technology gear found in the Iron Gods campaign is over 9000 years old and, since the spell grants no control over the restored items, who am I to prevent a foolish player from restoring an out of control annihilator robot to full health (like, say, the one encountered in Valley of the Brain Collectors…moo hoo ha ha ha!). Apart from the memory of function spell, none of the spells presented here will likely see much use in campaigns that do not have a high technology presence, though you could rename the irradiate spell “exhaustion” and otherwise use it as written. IS THIS A SPELLBOOK OR AN ENGINEERING TEXTBOOK? I hope these spells give players and DMs playing/running 5th Edition D&D campaigns with a high tech presence (like, say, the Iron Gods adventure path) some additional opportunities to add a high technology vibe to their games.